What do blueberries, black tea, oranges, and parsley all have in common? Besides being edible and fragrant, they all contain high amounts of flavonoids, a group of phytochemicals well studied for their link to fighting cancer. Plants are teeming with flavonoids, and humans consume a lot of them. Over the last two decades, lab and epidemiological studies have suggested that consuming high amounts of flavonoids may reduce the risk of breast, colon, lung, prostate and pancreatic cancers, but many studies are inconclusive or conflicting. Now an overview of the research, supported by AICR, provides new insight on flavonoids and cancer protection. Romagnolo’s review, published in the Journal of Nutrition in Gerontology and Geriatrics, found that the strongest evidence for dietary flavonoids reducing cancer risk was for cancers of the colorectum and breast. This may be, in part, because these sites also make up the majority of the flavonoid-cancer research; there are fewer studies, but still many, on pancreatic, liver and lung cancers. Researchers have now identified thousands of flavonoids. All are structurally similar, containing a ring of six carbon and hydrogen atoms – called a benzene ring. There are six flavonoid subclasses, including anthocyanidins, flavon-3-ols, and flavones, with each contain hundreds of compounds within them. The wide variety gives this group a diverse array of biological activities. Flavonoids act as antioxidants in our diets and are also responsible for the beautiful colors in our foods – from the red in pomegranates to the orange in apricots. Major dietary sources of flavonoids include fruits, vegetables and tea. In the United States, about 85 percent of our flavonoids come from the flavan-3-ols, which are found in tea, apples, cocoa, notes Romagnolo. Commonly recognized flavonoids include quercetin, found in onions and tea; catechins, found in tea and cocoa; and genistein, found in soybeans. For the review, Romagnolo identified approximately 80 human studies related to flavonoids and cancer published from 2005 onwards. It is only in the past decade, with the development of the USDA database on flavonoids, that studies began to more accurately quantify the consumption of flavonoids. “There’s been an active effort to improve how we estimate flavonoid intake,” said Romagnolo. It is likely that specific flavonoids reduce the risk of specific cancers. For example, a US study found no association between risk of ovarian cancer and total flavonoid intake, but it found a decreased risk linked to dietary intake of apigenin, a flavone commonly found in celery. 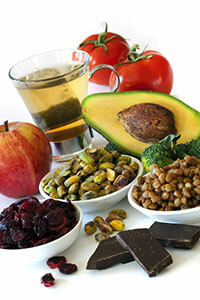 Certain flavonoids act specifically on hormone-related cancers. Flavonoids that are phytoestrogens, compounds that acts as a weak form of estrogen, affect tumors regulated by hormones, says Romagnolo, such as breast, prostate, and ovary. Genistein, for example, is a phytoestrogen found in soy. For breast cancer, the age you start consuming flavonoids may influence later cancer risk. Research points to a lower reduced risk of premenopausal breast cancer linked to consuming soy and its isoflavones in adolescence, compared to when consumed later in life. The mechanisms involved in flavonoids and cancer protection are complex. Flavonoids will inhibit processes that induce cancer such as proliferation, inflammation and angiogenesis. “There are many molecular targets so we can’t pinpoint a specific one. There are cascades and multiple pathways that overlap,” adds Romagnolo. Part of the reason for conflicting data on flavonoids may be due to questions on flavonoid intake and if the same compound affects people of different genders and ethnicities. Smoking may also alter how or if flavonoids provide cancer protection, says Romagnolo. For now, according to Romagnolo and AICR experts, there is no downside to eating a diet packed with flavonoids.